Two, count them… Two shows! This is another show that has fans buzzing and more than excited. Tears for Fears will return to Canada (Casino Rama just north of Toronto) this September for 2 days (25th and 26th). This will be immediately following the Michigan show (24th). The venue has a variety of seating options. Most of the front row seats are gone. Reviews on this venue are mixed. Some say it’s just not their favourite place to see a band in Ontario, Canada. However, many are going anyway. Looks fine to us as all the floor seats seem to be in clear view of the stage. See ticket links below for both shows and examine the seating chart carefully. Yes, you have to be at least 19 years old to attend. This is not an all ages show or one where you can bring your teens, tweens and toddlers. We’ve had several slightly aggressive requests for meet & greets plus “demands” for tickets. Please know we don’t have much power in those areas. It’s been a miraculous coincidence that we’ve been able to get the extra seats we had and so we decided to share those tickets. We always share or offer anything we can including any meetup opptys. We just don’t have them this time. Very sorry. Stay at the casino… period. That’s our suggestion. Click here to reserve. We’ve stayed at a number of casinos during our travel fan years and thankfully all of them have been very nice. We feel this one will live up to our standards as it offers quite a bit just like Sunset Station and Red Rock Casino in Vegas. If you are not a Canadian citizen, you need to get a passport. Not having a passport is not an excuse for not attending the show. You can get a rush passport. You can get the snailmail passport. The way we did it years ago was as follows: Download the application/pick one up from the post office. Passport photos were taken at a local Walgreens for a small fee. We filled out the passport info and submitted it. It was returned to us in 2 months. Passport prices vary depending on how fast you need it. A renewal is cheaper than a new one. You can also get a rush passport at most major airports. One girl forgot hers at home and had to get one on the spot in order not to miss the flight. I think she paid about $300 because it cost more to get one post-haste. This is not something you can leave behind. As you can see in the link. Gotta make a checklist before you get to the airport. Do a double check before you get to the airport or begin your drive into Canada. There have been too many issues where someone can’t find their tickets, travel wallet or passports. Put them in your Tears for Fears Travel Bag (made available in 2011 in Los Angeles). Do your best to keep up with your travel documents, pictures, etc. 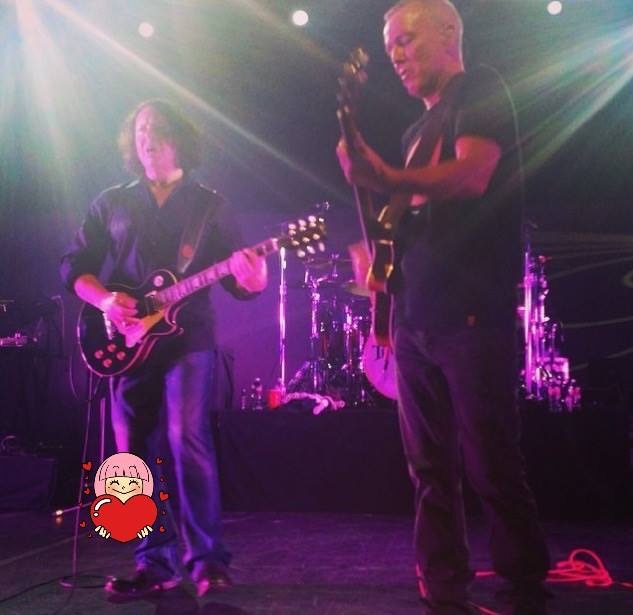 That heart is for both, it just generated on Mr. Orzabal’s leg. A lot! A lot…that’s all we can say… the show has not sold out but tickets have been on sale for quite some time. We tweeted about it prior to the announcement by the venue and we tweeted about it the day the venue put the tickets on sale. We are also talking/blogging about it right now. Few can say they just didn’t know. Anyone that reached out to us at shows or in the hotel was told about the blog. Again, just no excuse here. If you really want to go to this show and have the resources and time to travel then it can be done. If there’s anything we have forgotten let us know. Posted on 21/06/2015 06/09/2016 by International Business and Cultural ExchangePosted in Fan Travel Resources and Tips, Frequently Asked Questions (FAQs), How to join the Travel Fans, Tears For Fears Live Shows, Welcome to the Tears for Fears Fan Travel BlogTagged band travel, Canada Concerts, Carina Round, Casino Rama, Classic Rock, Concerts, Curt Smith of Tears for Fears, Ontario Music Scene, Roland and Curt are Kings, Toronto Music. Are the Tears For Fears Travel bags still available? We’ve not seen anymore. There was s request for more in late 2012 but so far the gorgeous blue water bottles (of which we stocked up on) are what surfaced from our list. Thanks. I wish TFF had an online store for merch. I am taking my wife for the 26th concert, and contacted management at Casinorama regarding a Meet, and here is their response: “..Hello. Thank you for contacting Casino Rama. Any Meet and Greet available for Tears for Fears would have to be set up through the artists fan club or directly contacting the artists directly your self. I do hope you have success in this and enjoy the show this weekend. Any suggestions in order to arrange a meet and greet? The band returns to Casino Rama Entertainment Center. The info we posted below seemed useful last time so we’re reblogging cause if it ain’t broke don’t go trying to fix it eh? Note that this is just one show this time around not two as of right now.